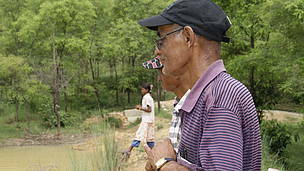 Kalika Community Forest lies in Lalmatiya in Dang district in the mid-western region of Nepal. The community forest user group (CFUG) is credited for the establishment of an innovative old age home for livestock and a vulture conservation center which is helping raise awareness and support for vulture conservation. Moti Adhikari, the president of the old age home for livestock and a vulture conservation center, has spent 16 years of his life helping build the community forest and finding a better future for vultures in the area. “As with any village, cattle form one of our primary means of livelihood. At the same time, cattle were known to pose considerable challenges in our village earlier,” stated Moti. “Uncontrolled grazing inside forest areas was becoming a major problem and was a primary reason for forest degradation. Old and sick cattle brought with them added issues. 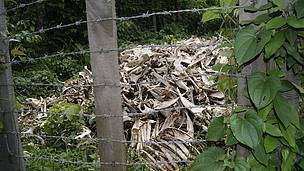 As there was no place which was especially designed for burying dead cattle, sometimes, the streets around our village would be strewn with dead carcasses and some would even start decaying before anyone did anything about it. This was putting the health of the local people at risk,” added Moti. Many of the local people including Moti also noticed a stark decline in the number of vultures in the area where vultures were once a common spectacle. They partly attributed this to the use of diclofenac, a veterinary drug used on livestock, which was apparently poisoning and killing the vultures who fed on the dead carcasses. This led the local people to start thinking of alternatives to restore their forests as well as vulture populations in Lalmatiya. An initial solution came with the establishment of the community forestry program in Lalmatiya in 1998. Under the program, the villagers started putting a stop to tree-felling as well as cattle grazing while planting fresh trees to enrich their forests. To further keep a check on uncontrolled grazing of cattle in the forests, the system of stall feeding was introduced wherein cattle were now fed at the cattle-shed itself. 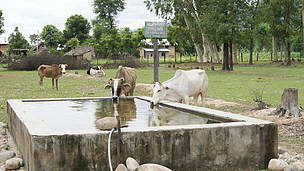 In the year 2008, the members of Kalika CFUG established the old age home for livestock as a unique initiative that blended faith with conservation to bring back vulture populations in the area. With cows considered sacred amongst Hindus, the members of the CFUG started building this home to take care of sick and old cattle and actually providing proper funeral rites to cattle that eventually died at the old age home. An open space was allocated outside the village where dead cattle are placed as an offering to the vultures. As an added measure for vulture conservation, the use of diclofenac on livestock was also soon banned by the local people. Three years hence, the work with the old age home has paid off. While there were merely 4-5 vultures in Lalmatiya earlier, today, the local people can boast of sighting of over 300 vultures. This has led to a win-win situation for the local people and conservation; the problems related with dead cattle have now been addressed while vultures have a better habitat and a safe food source. Members of the CFUG have also set up a vulture conservation centre which provides information on vultures and vulture conservation to visitors. Kalika CFUG is presently managing 465 hectares of community forests which is providing the local people with a sustainable source of livelihood through firewood, and fodder for their animals.. The forests are also now home to wildlife with new sightings of leopards, elephants and foxes by the local people. Kalika CFUG presents a unique example of locally-led solutions in biodiversity conservation and underscores the importance of building harmonious relationships between humans and nature. 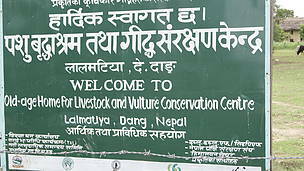 Their work in vulture conservation was duly recognized through the Abraham Conservation Awards presented to them by WWF Nepal in 2012.